David Allan is an e-book and paperback author. David Allan's books are published by the Create Space platform, and are titled "Paranormal Persistence ~Caveat~ True Experiences." David Allan studied Introduction to Psychology both One & Two. Mr. Allan also studied Developmental and Abnormal Psychology along with Anatomy & Physiology and Communications while attending Hocking College in Nelsonville, Ohio. David Allan is also a licensed Barber through the State of Florida but no longer practices in the field. 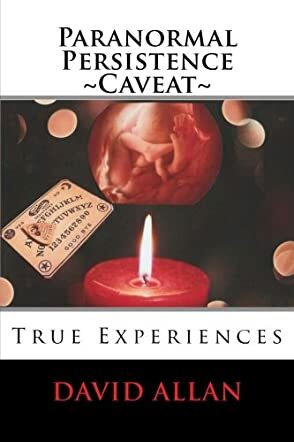 Paranormal Persistence ~Caveat~: True Experiences by David Allan is a collection of twenty-seven short stories revolving around the paranormal theme of experiencing something eerie and scary. The moving of souls from one realm to another, where the author speaks about the eternal life of the soul, is interesting to read throughout the stories, giving them a spiritual vibe too. Each story in the book is a compelling read and throws light on many strange things that happen to people in reality. The stories are disturbing because the book takes readers to another dimension with spiritual undertones and where one questions the credibility of events that happen in one's life. Each story gives a positive nod to paranormal happenings and there is an element of fear, too, that runs through the reader while perusing these stories. For readers who love to read about paranormal happenings and things in life, this book will definitely not disappoint them. It is an honest effort by the author to tell readers about certain paranormal facts and events that do happen outside the pages of a fiction novel. This collection of stories will make you look at a lot of happenings in life with a different perspective altogether. This book was the perfect read for the Halloween season!